And people claim it's because we're less active. 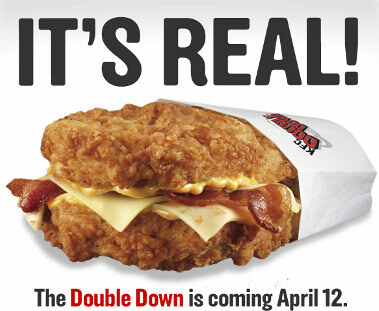 In the fried corner we've got KFC's "Double Down". Until now available only in select markets but the business folks over at KFC have determined that there's a national appetite for this breadless beast. Two deep fried chicken fillets serve as the bun for two pieces of bacon and two slices of processed cheese. 540 calories and 1,380mg of sodium. You've never seen the Mc10:35? Doesn't mean you can't have one as necessity is the mother of invention, and necessity here is apparently the need to eat something repulsive at 10:35am. The Mc10:35 is a "secret" menu item that's making some social networking waves. It's called the Mc10:35 because it's only available at or around 10:35am. You see 10:30am is when breakfast changes to lunch at McDonald's. 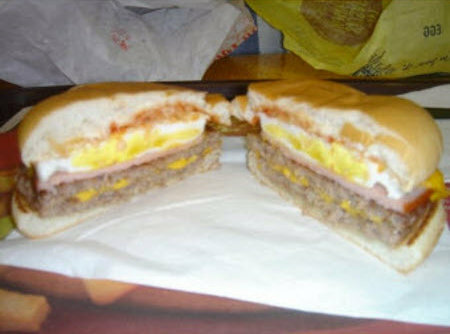 To order the Mc10:35 you'll have to order one of the day's last McMuffins and simultaneously order a McDouble. When your order arrives reassemble by taking the egg and bacon from the McMuffin and added them to the McDouble. Voila a Mc10:35. Estimated calories 560, estimated sodium 1,300mg. Nutritionally? Pretty much a wash. Yuck factor? Flip a coin. The Double Down. Because it's actually a real menu item whereas the Mc10:35 for now is something hungover college students will have to build for themselves.